I did it for love of manzanita. I am reposting this story from two years ago for the Hidden Art of Homemaking discussion at Ordo Amoris. It’s about one of my projects that illustrates some of the difficulties and satisfaction of interior decorating. A botanical theme has emerged. Decorating is a homemaking job that I wish I could get over and done with and on to other things. This post is about how the realization of that wish is a long time coming. On one level the story bores me to death, even though it’s my own house I’m writing about, the house I’ve been investing in for 20 years. That should warn most of my readers to leave right now and go read something more entertaining. What’s makes me want to tell this too-long tale anyway is the way it illustrates how an incredible amount of mental and physical labor can go into what seems a simple project. I suppose I’m not used to this precisely because I’m not into home decorating and haven’t applied my perfectionistic creative energies to it so much before. In a way it’s a larger-scale version of my doll clothes effort: what I envision doesn’t come in a kit. If I could make a kit out of it no one would buy it. It’s just the best that we could do given our priorities, and with a tract house that doesn’t have enough walls to be cozy or enough windows to brighten the view. The story I tell is also amusing if one considers the output of my mental energies compared to the mediocrity of the results. It is the main earthly business of a human being to make his home, and the immediate surroundings of his home, as symbolic and significant to his own imagination as he can. I’m not sure what all G.K. meant by that, but he does seem to give me liberty, and even to tell me it is my duty, to spend time on my house and property with the purely physical and aesthetic aspects in mind. So, I push on. Last year we changed the arrangement of the living room furniture so that the pictures on the wall didn’t work anymore. 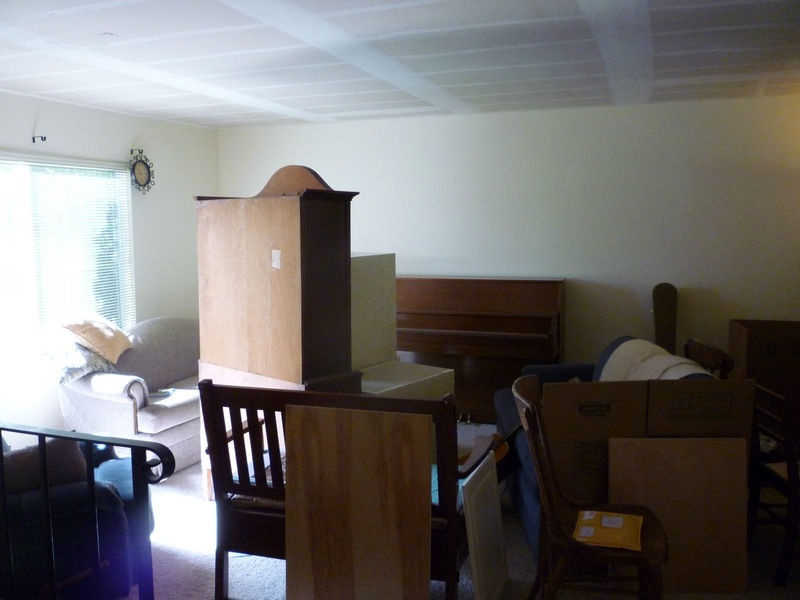 It seemed that the painting that used to be above a couch was too “heavy” after we moved the piano under it. It was then the largest wall item above the largest piece of furniture. Also, the TV had come out of the closet and found a new and permanent place in a corner, and the emptiness above it bothered me for months while I tried to figure out what to put there. I started looking online for manzanita, but I found only small and twiggy, pale specimens, for use in flower arrangements. So I gave up for a while and spent hours looking for a decorative mobile. Nothing pleased. By that time we were in the middle of the remodel, so it wasn’t urgent. Then in April we went north to Pippin’s place, where the previous winter’s record-breaking amounts of snow had piled up everywhere. 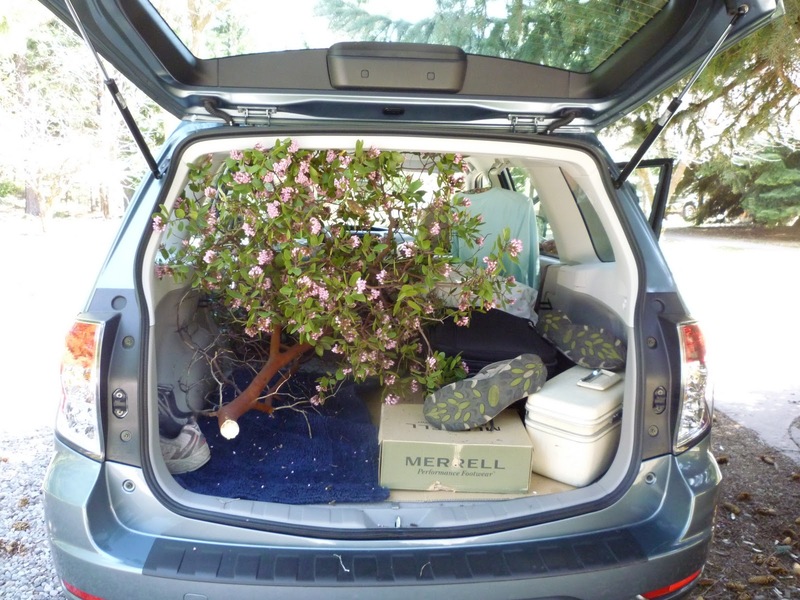 As we walked through her forest we saw several manzanita bushes with large branches broken off. 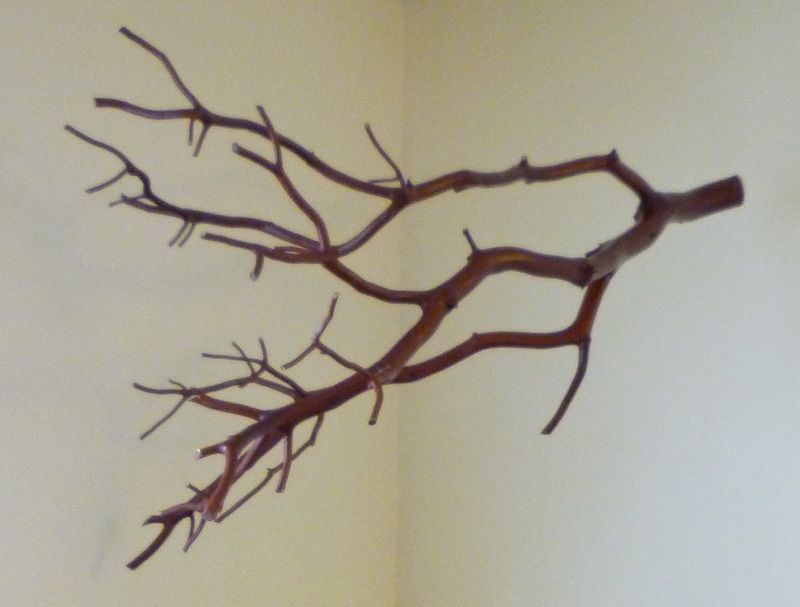 My mind started twirling around the idea that I could prepare my own decorative branch. The others helped me choose a couple that might work and we hauled them home. I still didn’t know if I could accomplish what I envisioned; I’ve never been one to do woodworking of any sort. I knew enough to trim off the flowers and small twigs. Then it occurred to me that wood needs to dry out before one can work it. I read that manzanita tends to split, so people have trouble making furniture out of it. Maybe my branches would split too much as they dried? I left them sitting around in the garage for a couple of months and they only split a little bit. On the Internet I read somewhere to paint them with Danish oil to preserve the wood, so I did that. And one of my children said I should stain the trimmed ends of the branch so the whiteness of the wood wouldn’t distract from the lovely smooth and dark bark. I think this is the one I didn’t use. It was B.’s upcoming birthday party that put the fire under me to get the chosen branch up in the corner. We bravely screwed two hooks into the smooth new ceiling, and I painted them white so they would fade into the background. Then three strands of fishing line were tied to those, and to the branch. Soldier was here and helped me position it just so; he’s tall and strong and could stand there calmly holding it in midair while I fumbled with the almost invisible threads. Then voilà! 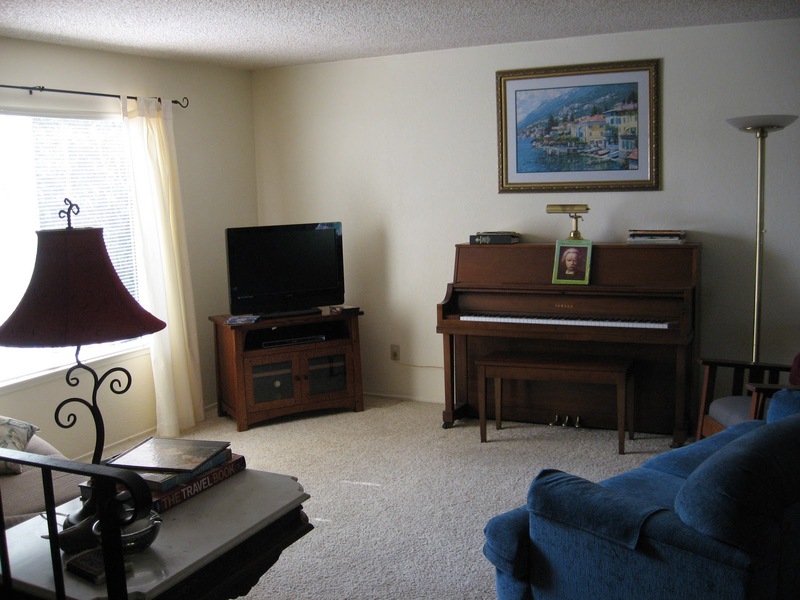 At last, that one part of my decor was in place (now we only had to ignore the empty space above the piano) and all our party guests could admire it. I began brainstorming on a solution to that remaining space nearby. Three weeks later I dusted the manzanita with a feather duster and the next morning it crashed onto the TV and to the floor. Nothing was harmed. Guess we needed stronger filament. It took me about two months to get to the store to buy it. Then it took another month before B. and I could make ourselves re-hang the branch. See what kind of do-it-yourself-ers we aren’t? I was sure I knew how to orient the branch, the way Pippin had told me to, but after B. and I got it centered and hung and he’d gone bike-riding, I realized by looking at previous photos that I had it exactly backwards, and it truly didn’t look the best. I tried just flipping it over, and that sort of worked; I only had to re-tie one filament, and we were o.k….except that now the branch was a little closer to the ceiling than ideal, and the top of it was vaguely lined up with the curtain rod, which didn’t look right. I suffered with that all through Christmas, trying not to care. Of course most people said it was fine because no one wanted to go through the difficulty of doing it over. 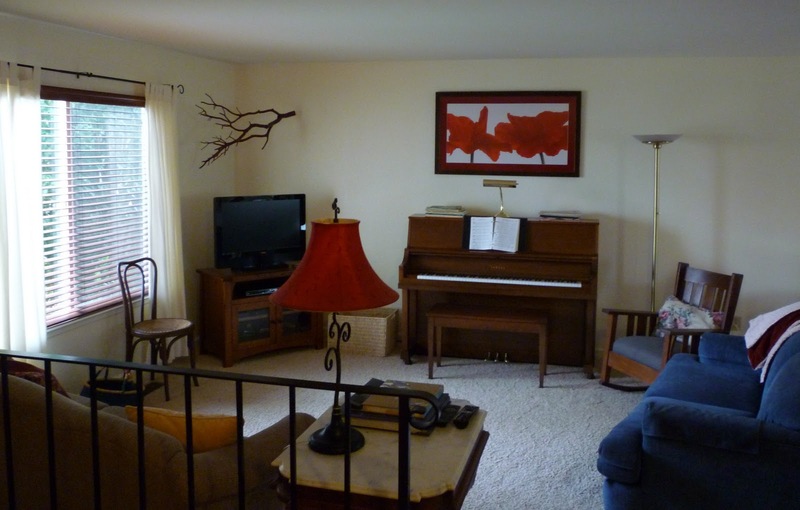 I had to buy a piano lamp before I could decide what would go behind it; our old one was shot. Piano lamps are expensive! The cheapest one I could settle on was out of stock for a few weeks, so we waited on that. I had looked at so many paintings or other wall decorations, many hours of browsing over several months, and found nothing I wanted enough to spend money on. But then we must return to how I’m not a woodworker, or a painter for that matter. I think it was on New Year’s Day that I felt desperate to make some progress; I decided to spend money and get something. B. and I knew we needed color there, and we knew the parameters of what the measurements needed to be. I bookmarked some paintings, and when B. came home from watching a football game we chose one and ordered it. Whoopee! The painting arrived and sat on the floor near its destination for over a week. I knew we needed to be in the right mood to even talk about putting it up. 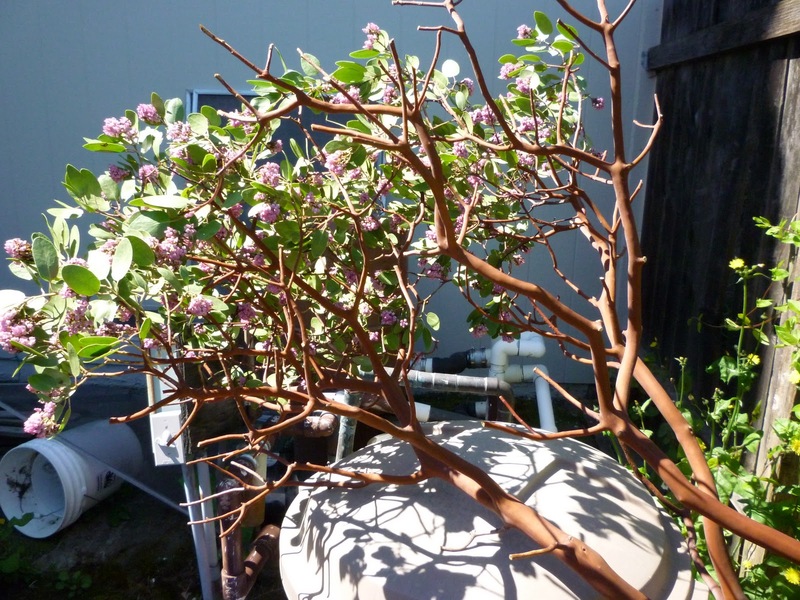 In the meantime, one day I got a burst of courage and all by myself re-did the lines supporting my manzanita. I think it might be as much as an inch lower. A most satisfying inch. Last week we hung the picture. Those are giant poppies providing the splash of color. I hope Mr. Chesterton is happy and won’t mind if I get back to my sewing and reading now. I remember this post from first time round! Oh that makes me feel very happy! Thank you for the Chesterton quote! It has given me something to think about and added to my day. I'm still unraveling what I think he means, but I think he's right! love the picture and i LOVE manzanita!!! one of my faves. I just loved this. I think we are both the same kind of decorators. I never can decide and when it is all said and done, I like to go back to the garden and the chickens and the flowers. I always say with 7 grandkids 6 and under I must be real. Legos stay under the tables and toys for the babies to play with. It will never grace the cover of a magazine, but when people come over they want to stay. 🙂 Maybe that was what Chesterton was trying to say, 🙂 I think it looks wonderful. TWO years ago? I remember this like it was yesterday. I still love it! Oh, the agony of decision making! I think the angst and the waiting and the making is part of what makes a house a home, instead of a design project. I love the branch. Our living room walls were white and stark for two years before we found an artwork we liked, and the other wall is still bare. Something will come. Maybe it will be a branch.. Yes, Chesterton is always good and right and your branch is a perfect complement to his idea of the imagination. And you remind me of how long it takes me to do something that seems so simple in my mind! A wonderful quote from Chesterton! the perfect sentiment for chapter 5. While reading your post I found myself looking like one of those 'bobble-head' dolls — you know, my head nodding up and down and up and down — becasue I can relate and agree and appreciate all you went through! But good for you! accomplishing what you set out to do! The transformation is wonderful!